ELK GROVE, Calif.--(BUSINESS WIRE)--KB Home (NYSE: KBH) today announced the grand opening of Sheldon Terrace, its latest gated community of new single-family homes in Elk Grove. Situated near Highway 99 and Interstate 5 for easy commuting throughout the greater Sacramento area, Sheldon Terrace is convenient to major area employers such as Cosumnes River College and Kaiser Permanente South Sacramento Medical Center and to downtown Sacramento. At Sheldon Terrace, KB Home will construct 175 two-story homes and offer four distinct floor plans. With up to four bedrooms and two-and-a-half baths, and ranging in size from 1,500 to 1,800 square feet, the homes at Sheldon Terrace also feature desirable design characteristics like expansive great rooms, two-car garages and elegant master suites. Pricing begins in the mid-$330,000s. Located just off Sheldon Ave. within the Elk Grove Unified School District, Sheldon Terrace is convenient to a variety of premier shopping and dining establishments at Delta Shores and Laguna Crossroads. Residents of Sheldon Terrace can also enjoy the community’s planned amenities, which include a playground and barbecue area. Outdoor enthusiasts can explore natural surroundings at nearby Stone Lakes National Refuge, which boasts trails, paddle tours and wildlife sanctuaries, or Elk Grove Regional Park’s aquatic center, sports fields, bike and dog parks and playgrounds. KB Home will host a grand opening celebration at Sheldon Terrace, Saturday, Jan. 12, 11 a.m.–2 p.m. during which attendees may tour the three elegantly appointed model homes. Refreshments will be provided. The KB homes at Sheldon Terrace will be built to current ENERGY STAR® guidelines and include WaterSense® labeled faucets and fixtures, meaning they are designed to be more energy- and water-efficient than most typical new and resale homes available in the area. These energy- and water-saving features are estimated to save homebuyers between $936 to $1,296 a year in utility costs, depending on floor plan. KB Home’s distinct homebuilding process allows buyers to personalize many aspects of their new home to suit their budget and style. After selecting their lot and floor plan, KB homebuyers can work with expert design consultants who guide them through every aspect of the process at the KB Home Design Studio, a retail-like showroom where they may select from a variety of design and décor choices, including countertops, cabinets, lighting, appliances and window coverings. The Sheldon Terrace sales office is located at 8884 Ariston Ln. in Elk Grove. From Hwy. 99 South, take Exit 288/Sheldon Rd. and turn left. Turn left on Lewis Stein Rd., left on W. Stockton Blvd. and left on Michener Way. Turn right on Kramer Ranch Way and continue to the sales office. The Sheldon Terrace sales office is open Mondays 2–6 p.m., Tuesdays through Fridays 9 a.m.–5 p.m. and Saturdays and Sundays 10 a.m.–6 p.m. For more information about Sheldon Terrace, or KB Home’s other new-home neighborhoods, visit www.kbhome.com or call 888-KB-HOMES. 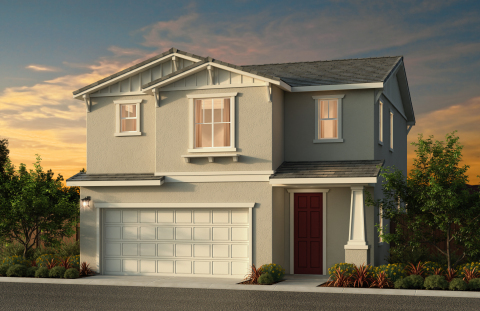 KB Home announces the grand opening of Sheldon Terrace in Elk Grove, California.